Assam Chief Minister Sarbananda Sonowal on Wednesday felicitated 131 wards of Assam Police personnel who secured 85 per cent and above in the HSLC and Higher Secondary Examinations, 2018 at a programme held at ITA Centre of Performing Arts in Guwahati. The programme was organized by Assam Police. Speaking on the occasion, Chief Minister Sonowal while terming the students as human resources of the state requested them to work hard to bring about much deserved qualitative changes in the society. He also called upon the students to strive hard to fulfill their aims and aspirations because hard work is the only tool which can take them to the zenith of success. 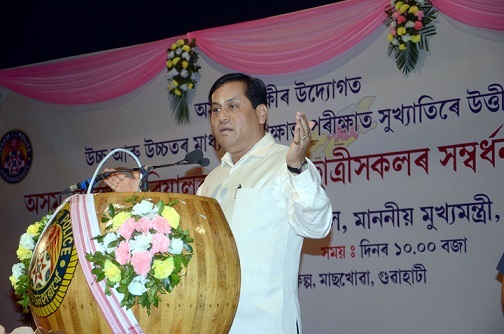 Referring to Prime Minister Narendra Modi’s reiteration of North East as the new engine of growth, Sonowal asked the meritorious students to take responsibility through their studies and success for repositioning North East as the spring board of India’s Act East Policy. He also said Assam is geo-strategically located in the North East and Guwahati is the Gateway to North Eastern Region. He pointed out that the recently held Advantage Assam: India’s Expressway to ASEAN has sufficiently pitched Guwahati as the gateway to South East Asian Countries. In such a changed situation in the region the students have the greater role to play to intellectually stimulate the society for better and positive changes. Referring to North Eastern Region’s great potential which is beaming with possibilities and prosperities, Sonowal called upon the students to take a greater role in making North East the reservoir of energy. He also said, “The future of entire nation hinges on you and you only can complement the State government’s efforts in making Assam as one of the best states of the country”. Sonowal also said that Assam Police personnel symbolize dutifulness. They remain in duty day in and day out and ensure security and safety to common people. Like their parents, the students should also dedicate themselves to the duty of studies to bring about fundamental changes in the society. Acknowledging the good results of the students, Chief Minister Sonowal as a mark of encouragement to the students, announced cash prize of Rs. 10,000 each. He at the same time appealed to the students to imbibe good human qualities and make a society eulogizing the values of humanity. He also gave an opportunity to a couple of students to speak on the occasion and express their experiences.